The 100 Watt Marshall Super Lead was THE amp that started it all for the greatest rock and roll tones achieved – or I should say, the greatest LOUD rock and roll tones of the 60’s. Yes, the Vox AC 30, Fender Bassman, and even the Marshall JTM 45 came well before Marshall’s famous 100-watter, but it was the Super Lead that upped the ante for high-powered rock performances and really is the standard by which all rock guitar tone is judged. With generations of guitar greats such as Jimi Hendrix, Jimmy Page, Edward Van Halen, and countless others all using the Super Lead with stacks of 4 x 12 cabinets, there is no wonder why this amplifier is legendary; especially the very earliest models, known as the "plexi" heads. We love our Marshall amps! 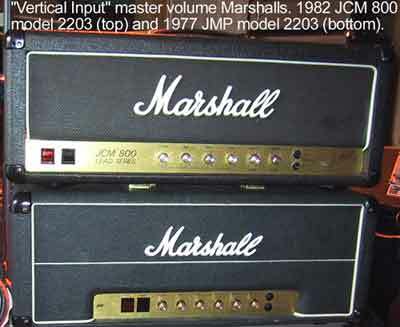 The purpose of this article is to recognize the various changes in the amplifiers from the “metal panel” era of the JMPs from to the JCM 2000 series so that the potential buyer can be better educated. Some deliver the goods better than others and I’ve owned many Marshall amps over the years and had to learn the hard way after plenty of dollars spent. Ultimately though — use your own ears and compare. Enjoy the next installment of our Marshall Shopper’s Guide. One of the most common questions we get here is, “What kind of Marshall amp should I buy?” We get countless questions not only about what type to get, but also questions about specific vintage vs. newer models, higher powered vs. lower powered models, types of speakers and how do they all sound, etc.